One of the things I miss about living in DC is the restaurant near my former office, Tortilla Coast. Sweet Pea Husband and I had our first lunch date here, and while it isn't the fanciest eating establishment in the world, it has good solid Mexican food. My stand-by lunch order was always their BBQ Chicken Quesadillas. Here is my attempt to make them at home, while adding a little more fiber and reducing the fat. When I make this recipe, I can almost see the Capitol Rotunda and Cannon House Office Building, taste the margaritas and hear the Capitol Hill/political banter in the background. Combine the chicken, beans, tomato, red pepper, green onion and BBQ sauce in a bowl. Spread 1/4 mixture on top of a tortilla, top with 1/2 cup cheese and cover with a second tortilla. Press gently together. Repeat with remaining tortillas. Spray a saute pan with cooking spray and heat to medium heat. Cook on one side about 3-4 minutes and then carefully flip, cooking on the second side 3 minutes. Repeat. Serve with light sour cream and lime wedges. According to my Whole Foods “100 Food to Live By” 2008 Calendar (free in stores), January is National Soup Month. Soup is the perfect cold weather meal and there is no way around it…it is cold here today. Yesterday it didn’t even get into the twenties. Time to warm up the family with a comfort recipe that everyone loves. I got this recipe from my father-in-law (who does most of the cooking in the family), who learned it from his mother. It is the easiest, not-so-fattening comfort food I have ever tasted. Definitely an oldie, but a goodie. Place the chicken in a large stockpot, cover with water until it reaches 1-2 inches over the chicken. Add celery, carrots, onion and salt. Bring water to a boil and then simmer. After about 20-30 minutes, skim the foam off the top of the water and then check to make sure the chicken is fully cooked. Let water and chicken cool (if you are in a hurry, you can remove the chicken and cut it up while it is still warm). Remove the chicken and take the meat off the bones (will be falling off) and dice. Once you are ready to eat, return the chicken to the pot and bring to a simmer. Add a few tortilla strips at a time, until all are in the pot. The strips will become like little dumplings. Let simmer for about 5 minutes and serve. My favorite way to cook casseroles or soups is to double the recipe and then freeze half. 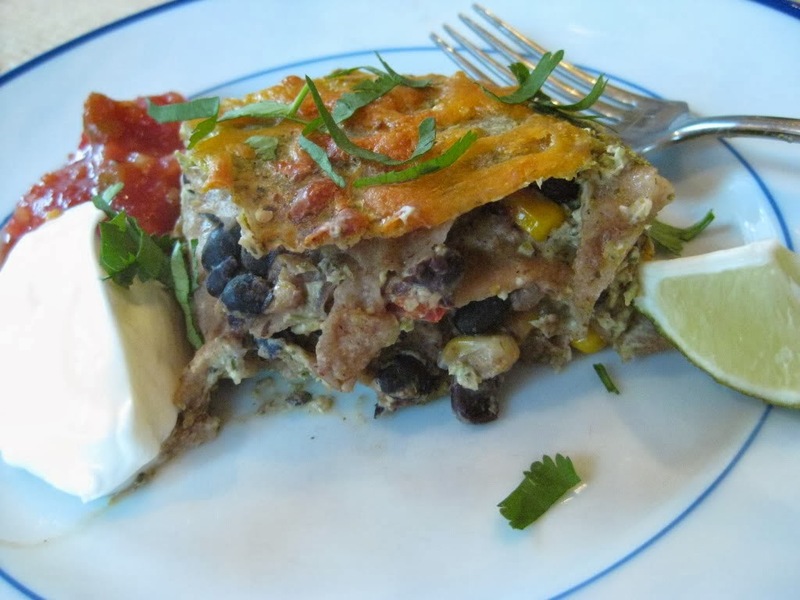 This recipe makes two 9 X 13 casseroles that the whole Sweet Pea family gobbles up! 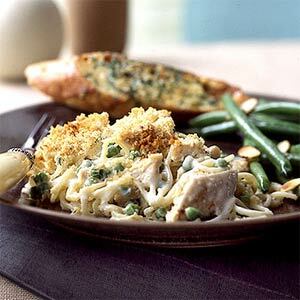 It is a lightened Chicken Tetrazzini recipe that I have powered up with additional vegetables. Enjoy! 1. Place a very large stockpot over medium-high heat, adding olive oil, onion, celery, pepper, salt, and mushrooms. Cook until the vegetables are really tender, about 7-8 minutes. 2. Add the beer and cook 2 minutes. 3. Add the flour, stirring constantly to fully incorporate the flour. Slowly add the broth, bring to a boil and then simmer uncovered, for about 5 minutes. 4. Remove the pan from the heat and add the shredded parmesan, cream cheese and mix until the melt. 5. Add the pasta, chicken, peas and cauliflower. 6. Divide the mixture between 2 9x13 casserole dishes, coated in cooking spray. 7. Top each casserole with grated cheese and panko/breadcrumbs. 8. Bake one at 350 degrees for about 25-30 minutes or until lightly browned and bubbly. Let stand for 10 minutes before cutting. 9. Freeze the second casserole. When you are ready to eat the frozen one, thaw it fully overnight and cook for 45 covered in foil, 45 minutes uncovered. As your baby gets older, you can also puree fruits and vegetables and even meats. Baby Sweet Pea likes a ground meat-sweet potato-pea puree that I made recently. My baby just doesn’t like the food I am making him/her. He/she only likes jarred food. What’s the deal? Try cooking the food longer, adding more liquid as you puree or even a bit of cereal and liquid. If you can get the consistency right, I guarantee your child will not be able to tell the difference between jarred and homemade food. My baby is allergic/doesn’t like/won’t eat XYZ food. I have an enormous amount of said food in my freezer. Now what am I going to do with it? Eat it! Use it for your family. Get a copy of the Sneaky Chef or Deceptively Delicious book and find ways to sneak a vegetable or fruit boost into your own food. I do not have fun making my own baby food. It stresses me out! Then by all means, go to your store and buy some baby food. It is not worth risking your emotional well-being to make your own food. Peel well-ripened fruit and remove the seeds, pit and stem. After the trays of puree are completely frozen, pop out the cubes and store in a marked freezer bag. When you are ready, put the number of cubes you wish to thaw either in the refrigerator overnight or in the microwave to cook immediately. If you are going out for a play date or will be on-the-go, put them in a small Tupperware for easy transport. 1. Peel apple and remove seeds and steam. Cut into quarters or pieces and steam in a steamer basket in a sauce pan filled with an inch of water or microwave with a small bit of water until apple is very soft. 2. Repeat steps 2-5 as above. 2. If the mango is well ripened, simply place in the food processor and puree, if not, you may want to steam it a bit first. Repeat steps 3-5 as above. **Once your child is ready for slight texture in his/her food, you can easily make banana or avocado baby food by simply mashing either with the back of your spoon, a la guacamole! Rinse the outer skin, and place sweet potatoes whole (prick the skin with a fork to help them “breathe” while cooking)/squash in half (cut side down in a glass pan) in a 425 degree oven for about 45-55 minutes or until squishy. Peel the carrots and cut into pieces small enough to fit into your steamer…the bigger the pieces, the less nutrients lost during steaming (because of less surface area being steamed). Steam in a steamer basket placed in a cooking pan with an inch or so of water in the bottom or in the microwave until very soft and mushy. Place the mushy carrots in a food processor and puree. If the mixture is not creamy enough, add some formula, breast milk or use some of the water from steaming until the consistency is right. Wash the beans and remove the ends. Steam in a steamer basket placed in a cooking pan with an inch or so of water in the bottom or in the microwave until very soft and mushy. With beans and peas, since they have a tougher skin, it is very important to steam until they are very well cooked! Steps 3-5, same as above. Unless you can find fresh peas, I have always used frozen peas. Some things I read said not to use frozen peas and then refreeze them but I always did with no problems. Use your best judgment. Place peas in a steamer basket placed in a cooking pan with an inch or so of water in the bottom or in the microwave and steam until very soft and mushy. With beans and peas, since they have a tougher skin, it is very important to steam until they are very well cooked! *Consistency is a huge issue for young babies. Especially for “first foods,” a baby is going to want a food puree that is not much different than breast milk or formula. Make sure you process the food well enough to make it like a thin pudding consistency. If the food you are pureeing continues to be gritty or not smooth, even after you add liquid, chances are you did not cook the food long enough. I am often asked by friends and friends-of-friends about making homemade baby food. Homemade baby food is easy to make, cost effective (especially if you are using organics), and allows you to introduce your baby to a much more varied diet at an early age. Pour the food puree into ice cube trays to freeze, reserving some of the puree for your sweet pea’s next meal. Pick the cubes you need when you are ready for mealtime, and thaw them in the microwave or refrigerator. My cousin C, who loves all sorts of food and does a great job exposing her three little ones to healthful eating shared an idea with me. When she was young, her dad would take her and her two brothers to the grocery store each week to do the shopping. During their visit, they would go to the produce section and try a new kind of fruit. It was a mini-produce adventure and C has really neat memories of picking out each week's fruit. Once home, they would gather around and eat it...things like star fruit, blood oranges, ugli fruit, tangelos, and more. Even kiwi, pineapple, and other fruit you can readily find can be an adventure for a child, if they have never had it, or if in the case of pineapple, perhaps never seen how it goes from whole fruit to tiny yellow tidbits. I tried this with my two Sweet Peas this week with blood oranges. R was amazed at the color of the inside, and G, well, he is still only 11 months old, but he seemed to like tasting it. I may continue this tradition...seems like a great way to broaden little one's tasting horizons. Another great, light, oh-so-good slow cooker recipe. If your kids are hesitant, tell them the sausage is "hot dog" in spaghetti sauce. It's all in the marketing...sometimes. 1. Mix all ingredients except shrimp and rice into the slow cooker, cooking on high for 3-4 hours or low for 7-8 hours. 2. Stir in shrimp and rice, and stir well. Turn slow cooker to high and cover for about 15 minutes to allow everything to be thoroughly warmed. Now I am off to whip this recipe together for our dinner tonight! Want an easy, fun, and perhaps new (at least to this Sweet Pea mom) way to make popcorn with your little ones? Take a small brown paper bag and fill it with about ¼ cup of popcorn. Close the top and fold down about a ½” twice. Place standing up, in your microwave and zap it for a few minutes on high. Just like regular microwave popcorn, stop when the pops are more than a second or two apart. I was amazed at how easy and good this popcorn was to make. I spritzed some olive oil on it and sprinkled a bit of salt. YUM. So there you have it…fun, delicious and a healthy snack. What could be better?